Once when Sibi Chakravarthi has been tented here with his warriors here, a white boar crossed him. He chased It and the Boar finally went inside a hole. Saint Markandeya was under penance here and King Sibi narrated the incident that occured here and the saint asked the king to perform a Milk Abhiseka to the hole. While doing so Lord Vishnu appeared before them. So Saint Markandeya asked Sibi Chakravarthy to bring 3700 Vaishnavites from North and build a temple here for Lord Vishnu. As requested Sibi Chakravarthy brought the 3700 Vaishnavites from the North and built the temple. While do so one of the Vaishnavite died and King Sibi was very much worried about it. Lord Vishnu again appeared Himself as a Vaishnavite and told King Sibi to count Him and make the numbering as 3700. Saint Naradhar's disciple Uyyakkondaar wrote "Sri Bhaashyam", which was left unfinished by him and was finally completed by Vishnu Sithaar. So this rock is called as "Uyyakkondaan Malai". There are two entrances to the temple viz. Uttarayana Vasal (Entrance) and Dakshinayana Vasal used during respective periods - Thai to Aani (Jan - July) and Aavani to Margazhi (July to jan). There is one more entrance namely the Naazhi Kettan Vasal signifying the entrance used by the Lord when he came late and was questioned by Thayar. One could have darshan of Sridevi, Bhoodevi, Surya , Chandra, Aadisesha in Prakruta sharira serving the Lord. Avathara Sthala of the Acharyas - Uyyakondar and Engallazhwan. Special Information: This temple has a big wall (Mathil sevar) Birth place of Bhakthar Uyyakondaar. Situated on top of a Mountain which is fall of white rocks and 100 feet high. (Vellarai means white rock. Since, this sthalam is situated at the top of a small white mountain, this sthalam is called "Thiru Vellarai"). Access to the temple Bus facility available from Trichy. This is on the way from Trichy to Thuraiyur. The sanctum sanctorum is about 50 ft high. The front Gopuram is still incomplete. We can hear echoes in the inner prakaram. The Moolavar of this Sthalam is Pundarikakshan. Moolavar in standing position facing east direction. 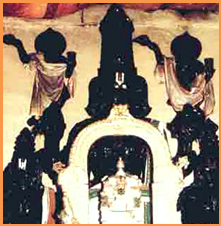 Prathyaksham for Garudan, called as "Periya Thiruvadi", Sibi chakravarthy, Bhoomi Piratti, Maarkandeya Maharishi, Lord Brahma, Rudhran (Lord Shiva). This temple is located at around 16kms from Trichy on Trichy - Thuraiyur Road. From the main road the temple is around 1 1/2 furlong inside the village. There are plenty of buses from Trichy and Sri Rangam via Uththamar Koil to Thiruvellarai. There is no much facilities available here. So We had to stay at Trichy and visit this temple. Nearby to this temple is a famous Lord Shiva's Temple "Thirupaijili"